She is a straightforward ranged agility hero, that deals a great amount of physical DPS from a safe distance. Her agility happens to be her greatest and most important asset—emphasized by her ultimate ability Marksmanship. This passive ability gives her a fixed amount of bonus agility at all times, as long as there are no enemy heroes within a 400 unit radius of her. The bonus agility significantly increases her damage output, armor, and attack speed—which all allow her to dish out huge amounts of pain when farmed. Her other abilities help her keep would-be killers at bay. Frost Arrows slows down her target’s movement, thus preventing them from closing the distance and possibly removing the Marksmanship bonus. Gust silences anyone caught in its area of effect, whilst pushing them back as much as 350 units. Precision Aura, on the other hand, just straight up increases her attack damage—though there is an active component which allows it to affect friendly ranged creeps all over the map. This actually makes her very potent at pushing down towers, even without that many items on hand. She is, however, slow-moving and fragile as all heck. This makes her easy prey for high-mobility heroes that can jump right on top of her and disable her Marksmanship before she has a chance to respond properly. Positioning is also key for Drow Ranger, meaning that some amount of game sense and a decent reaction time is required to play her correctly. Done right, though, and Drow can take over games almost entirely on her own. Her damage is consistent all throughout, and takes objectives really well when given plenty of EXP and farm. She is also the core component of “Drow cheese” strategies, which involves drafting a hero lineup composed of nothing but ranged heroes. This strategy seeks to mow down towers early on, choking the enemy team of precious space and resources. Give Traxex a try. She might just be the archer you’re looking for. 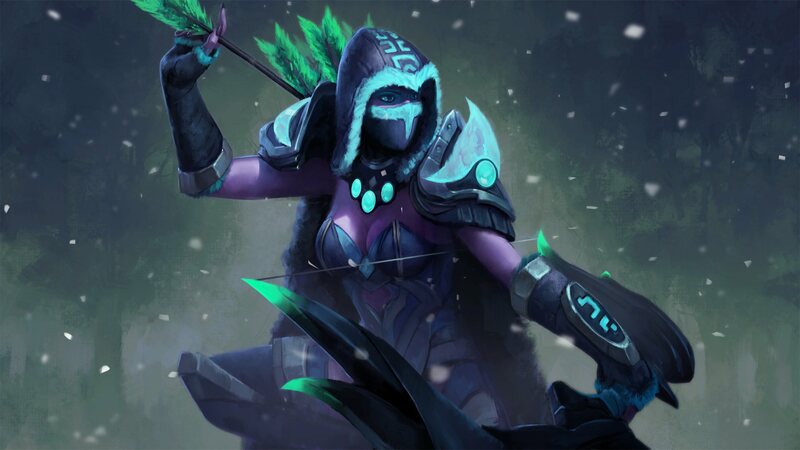 Drow Ranger’s skill progression in the early game focuses on giving her an easier time last hitting creeps, while maintaining a modicum of safety and elusiveness. As soon as the game starts, we recommend holding onto your first skill point, as you and your team move out on the map to grab the initial bounty runes. If no action presents itself, then you should be free to put the first point into Precision Aura. Otherwise, be ready to take a point in either Frost Arrows or Gust, with the former being the more aggressive choice. In most cases though you will want to play it safe with Gust instead, so that you don’t suffer a big setback before the creeps even spawn. Assuming the laning phase proceeds as normal, continue maxing out Precision Aura. Invest into Marksmanship at every possible opportunity, as it greatly increases your damage and attack speed—and thus, the rate at which you farm. Frost Arrows should generally be maxed out second, as the scaling of its movement speed slow is too good to ignore. The scaling on Gust’s silence, on the other hand, isn’t that great—and disabling enemy heroes isn’t really your primary objective anyway. Use Gust when needed, of course, but investing heavily into it in the early to mid game isn’t necessary by any means. Traxex generally favors items that straight up increase her DPS, or help her survive by way of hard durability (Black King Bar, Linken’s Sphere, evasion gear, etc.) or better positioning (Force Staff/Hurricane Pike, Blink Dagger). Before getting to all that, however, it is imperative that you get a Yasha, in order to increase your movement speed and attack speed for the mid game. Yasha serves as a farming item first and foremost, and combined with Marksmanship really accelerates your GPM significantly. Later on, it is used to build Manta Style, which is one of the best core items to get on Drow Ranger bar none. Of course, as mentioned Drow Ranger still needs to shore up her natural fragility. Since she is extremely vulnerable to heroes with built-in gap closers, Black King Bar and/or Linken’s Sphere are good choices to protect against disables and high-damage nukes. In most cases, the former item will be the best pickup, though of course against lineups with the ability to pierce through magic immunity Linken’s Sphere would be ideal. Force Staff and Hurricane Pike, on the other hand, allow Drow Ranger to stay at her optimal attack range while keeping people out of her Marksmanship disable radius. After all, a Drow Ranger without her agility bonus becomes a completely watered-down version of herself, which means preventing enemy heroes from getting close is even more important beyond just survivability. Once you address her obvious weaknesses, you can proceed with purchasing damage items. Daedalus, Monkey King Bar, Butterfly, and even Mjolnir are all fantastic pickups for an attack speed-focused carry, and can help close out games before a harder carry manages to catch up. Aghanim’s Scepter also increases your pushing power, since it turns your regular attack into one with a splash damage component. Countering Drow is actually really simple: get up close and personal. Close quarters combat is the one thing that Drow Ranger fears the most, especially when she isn’t farmed enough to fight toe to toe. Heroes like Storm Spirit, Axe, Tusk, Clockwerk, Huskar, and others with similar instant initiation abilities therefore do very well against her. High-damage nukes should also be prioritized when playing against Drow. Her low strength gain and lack of escape mechanism outside of Gust means that she practically blows up instantly when hit with something like Laguna Blade or Finger of Death. Tinker in particular destroys Drow Ranger, since he can nuke her down outside of her normal attack range. The same goes for stuns and disables. If Drow is simply unable to fight back, she will die nine out of ten times shortly after. This also takes her DPS completely out of a teamfight, thus making it easier for your team to survive the engagement.